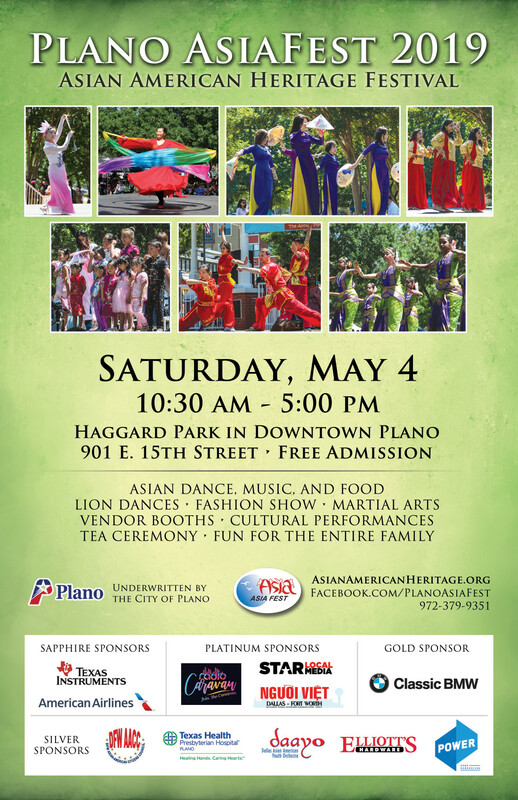 Join us for the sixteenth year of Plano AsiaFest. 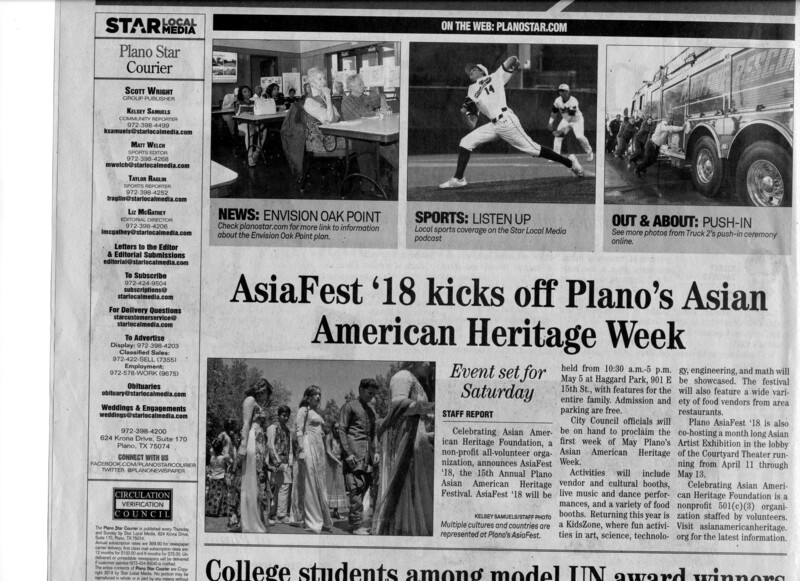 AsiaFest '19 will showcase the rich cultures of Asia: Japan and Korea in the north; China, Taiwan, and the Philippines to the east; Vietnam and Malaysia in the south; and Bangladesh, India, and Nepal in the southeast. The numerous cultural demonstrations, performances, and vendors will provide a fun and engaging time for your entire family. Chinese, Japanese, Korean, and Indonesian languages are considered as four of the seven critical languages by the US government. Come and learn the characteristics of these languages and see if you and your kids have an aptitude for these fascinating Asian languages. Asian medicine has been practiced in Asia for over three thousand years and it is still an integral part of health and healing. Chinese and Indian medicine practitioners will answer your questions about how alternative medicine works and demonstrate healing techniques such as acupressure, cupping, message techniques and more. Experience the cultural songs and rhythms created by a variety of indigenous instruments. The music is often accompanied by graceful ethnic dances. Feel the hypnotic beat of the Japanese Taiko, the Korean Samulnori, and the Chinese drums that accompany the lion and dragon dances. The flowing robes, the traditional costumes, and the colorful saris worn during the performances turn AsiaFest into a veritable fashion parade. Be awed by the fitness, skill, and finesse of the martial arts demonstrations. Many look forward to these displays of discipline and power. View and purchase unique items from various cultures, from jade and porcelain to artifacts and ethnic garments. 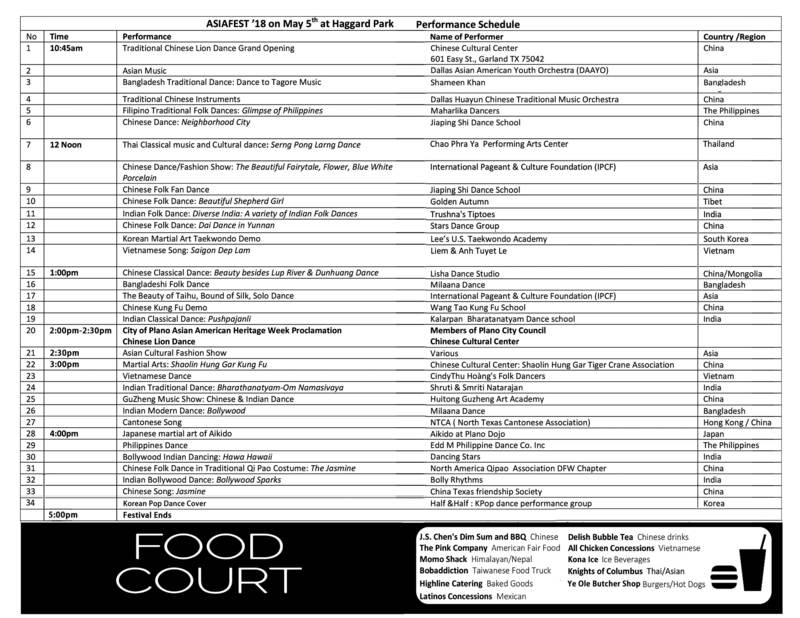 Experience delicious Thai, Chinese, Indian, Japanese, and American food from our numerous vendors. Your children will enjoy art activities such as painting, drawing, and modeling. They can view and try out various musical instruments. New! AsiaFest has a special Children's Corner with various fun booths for children! 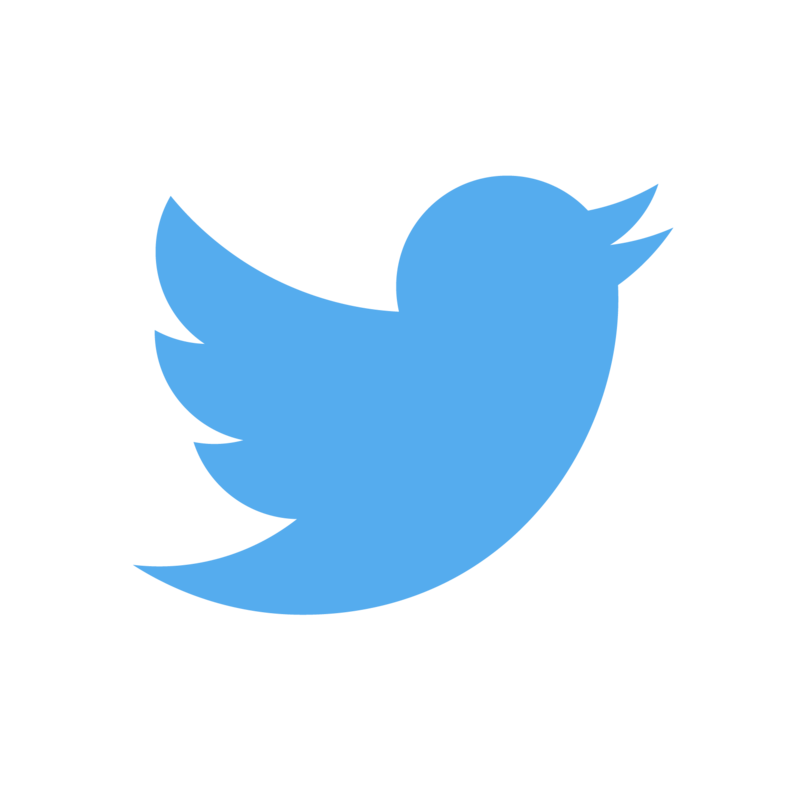 Like our Facebook page today so you won't miss a beat! You'll be kept in touch with all the latest updates about AsiaFest 2018. Click here to visit our Facebook page! 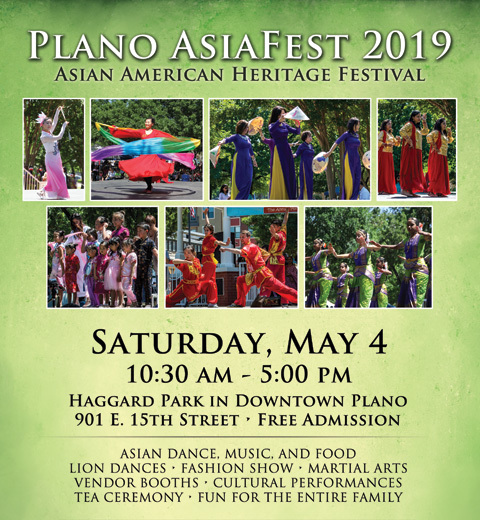 Car: Free parking is available for eventgoers at the Plano Municipal Court's parking lot, located on the southeastern corner of E 15th St and H Ave.
Public transportation: AsiaFest is right next to the Downtown Plano Station of the DART Red Line. If you're coming from the north, you may also park at Parker Road Station and take a short ride down. From the south, simply walk/park and ride at a DART station and come on up here! Please see our volunteering page for further information. See our forms page for more information. Thank You AsiaFest 2019 sponsors! 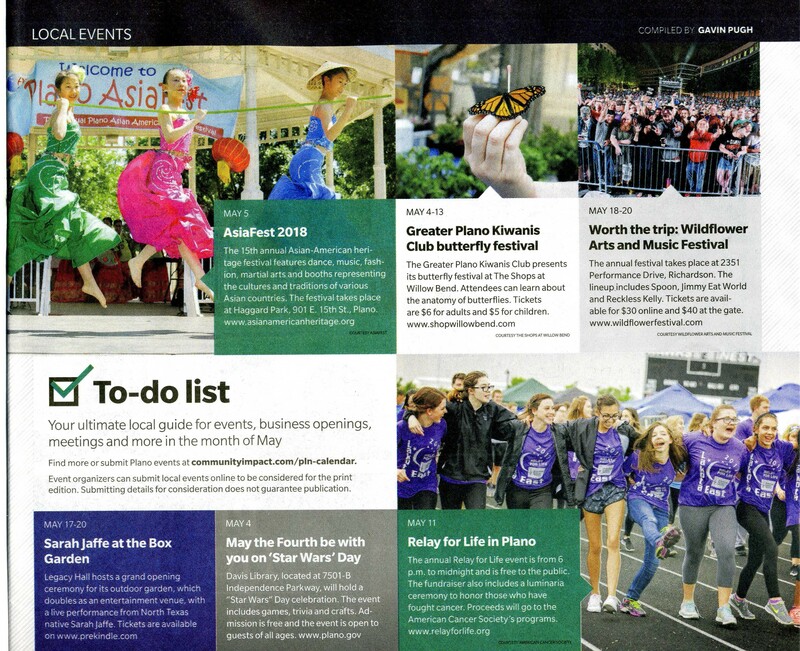 If you'd like more information about sponsorship opportunities for AsiaFest 2019, click here.